The Torino scooter was designed in response to many requests from persons who are larger in stature than normal and this attractive and heavy duty scooter was the result of many hours of research and testing by Shoprider. This very manoeu three wheeled scooter has a 2 horse power motor enabling it to propel greater weights with ease. 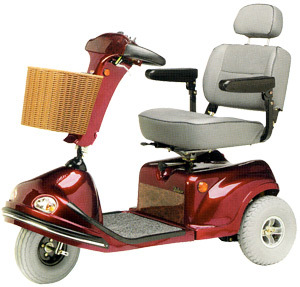 It is fitted with a very comfortable 22" wide Captain seat to accommodate larger persons weighing up to 440lbs. In addition to having 13" pneumatic tyred wheels the Torino is fitted with suspension to ensure that a comfortable ride is available even with extra weight being carried. To conform to class 3 regulations it is supplied with a full light set which includes front and rear lights, reflectors, indicators and hazard flashers. A horn and hand brake are also fitted as standard equipment. By flicking a switch the Torino is able to increase speed from 4mph up to its maximum of 8mph making this substantial scooter a worthy class 3 scooter.